Good relations with governments can get twice the results with half the effort. This is especially the case when it comes to multinational companies (MNCs) considering forays into new markets. "The government creates the climate for business," US Assistant Secretary of Commerce David Bohigian said at a clean-energy forum that opened today in Beijing, highlighting the government's role in developing new energies. A growing number of MNCs have realized the importance of garnering government support in doing business. 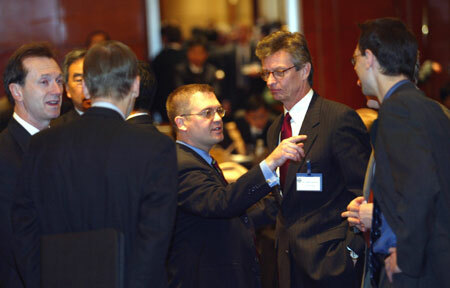 The Bohigian-led trade mission, visiting China January 8-13, was joined by 16 clean-energy enterprises. About two-thirds of the companies set government relations as one of their primary goals for the trip. Relations with the central government are vital, and relations with local governments are also critical, said Lester Ross, managing partner of US law firm WilmerHale, at the forum. Business lobbying, when enterprises persuade government officials toward policies and legislations reflecting business interests, is quite popular in the United States. Lobbying as such is important in China, too, in dealing with government relations, but is carried out differently. Before coming to China or in case of major problems afterwards in China, MNCs have to maintain good relations with the governments. There are a number of ways to achieve this. First, top company executives visit China to meet the country's major governmental chiefs, and promote cooperation with China through improving trade ties between the two countries. Second, MNCs cooperate with governmental organs in China. Lastly, MNCs improve local government relations. The trade mission will visit China's Beijing, Guangzhou and Hong Kong, and India's Kolkata & Bangalore. David Bohigian will lead the mission with coordination from commerce staff in China, the United States and India, thus giving the participants broad exposure to governments involved. Boston-Power, a member of the trade mission, is a young company that is bringing next-generation lithium-ion battery technology to market. Also new comer to China, the company said its only goal in joining the mission to China was to make contact with the Chinese central and local governments. The quality of government relations with the host country often serves as a touchstone for companies venturing into that country. That's why many companies set aside special funds for public relations (PRs), of which government relations play a major part, and attach more and more importance to related crisis management. However, when most MNCs first come to China, they tend to outsource government affairs to international PR companies. As their business grows, PR companies usually give less priority to government relations management. In addition to higher costs, governments' dislike of contact with third-parties is one of the causes. In China, communications channels between MNCs and governments include direct ties with governmental departments, liaisons with government-affiliated associations, and relations with renowned universities or government think-tank research institutes. However, no matter the channel through which MNCs build their government relations, the communications must be of mutual benefits. "Government relations do not rely on skills, but on something substantial," Ye Ying, chairman of Kodak China, said. "Even when I went to meet the premier, my objective was to report the progress of our projects. It is essential to find feasible cooperation projects with the government." General Biodiesel, another member of the trade mission, brought four projects to China this time. The company has picked destinations for the projects at Beijing, Shanghai, Shenzhen, and Wenzhou of Zhejiang Province, according to company CEO Yale W. Wong, an American Chinese. Wong said government relations are surely important. As the Chinese government launches a series of policy incentives to encourage investments from American Chinese, and welcomes them here, his company is doing well in the country.